It’s not clear whether the free skin is on offer anymore, but it’s also worth pointing out that Halo 5 is an Xbox One exclusive, so there would have been no slices on offer on PC whatsoever. You can see what could have been in that tweet, which we’ve embedded further down this article. 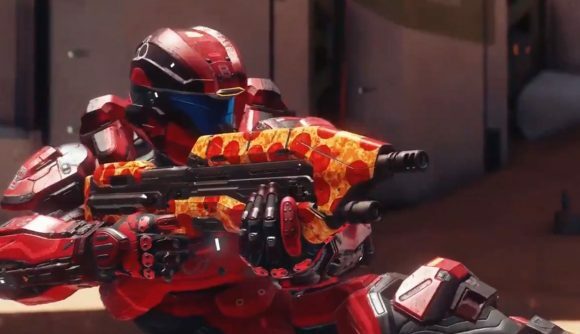 In case you’re not up to date, it’s worth pointing out that this Halo/pizza crossover has quickly become something of a community joke. It all kicked off earlier this month, when a fan posted to Reddit saying he’d buy the game’s developers pizza if The Master Chief Collection came to PC. That was followed up with two posts from community director Brian Jarrard, who took to Twitter and Reddit with pizza-themed teasers. After the game’s official announcement, the joke took a step further. Throughout the day, grateful fans began sending pizza to 343. In the end, so much arrived that Jarrard had to ask players to stop, as there was simply too much food for the team to get through. Details about the anthology’s PC release are relatively thin on the ground. We know that it’ll include Halo: Reach, and that games will release one by one, but in terms of a release date, the devs say it’ll be “ready when it’s ready.” Thankfully however, there will be a chance to play it early, due to a the Halo Insider program, which you can sign up to at the link above.